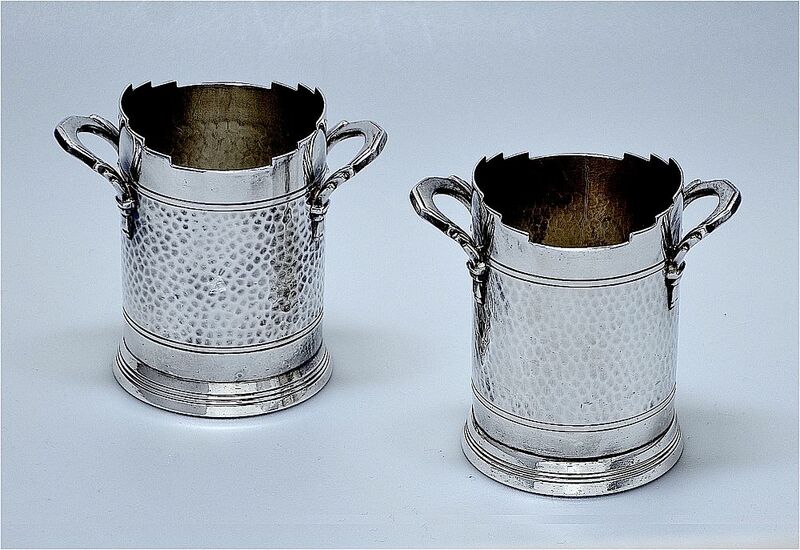 These fabulous small wine bottle holders were designed by Keith Murray for Mappin & Webb during the early 1930s. Made in silver plate each one has the Murray signature design of a tiered base with 3 incised rings leading to a cylindrical with a crenelated top and handles. Unusually the middle section of the cylinder has a hand beaten finish surrounded on each side by 2 incised lines. Both pieces are signed "Triple Deposit Mappin & Webb's Prince's Plate London & Sheffield". Both have a symbol like a stylised triskelion and the numbers W28121. Both have a shield shaped cartouche one with the date letter "K" and M94 and the other with the date letter "L" and O19. A really pretty pair.